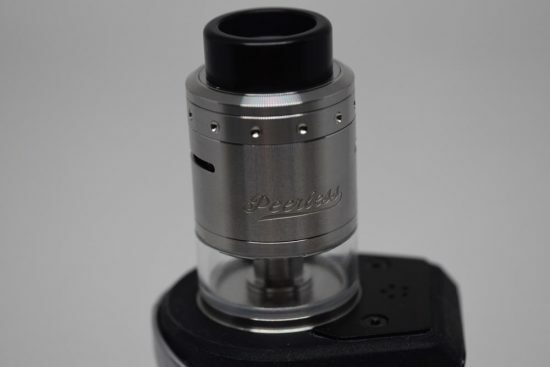 If you loved the GeekVape Peerless RDA (Special Edition), but wished you could use it for longer without constantly having to drip juice into it, the new Peerless RDTA has you covered. 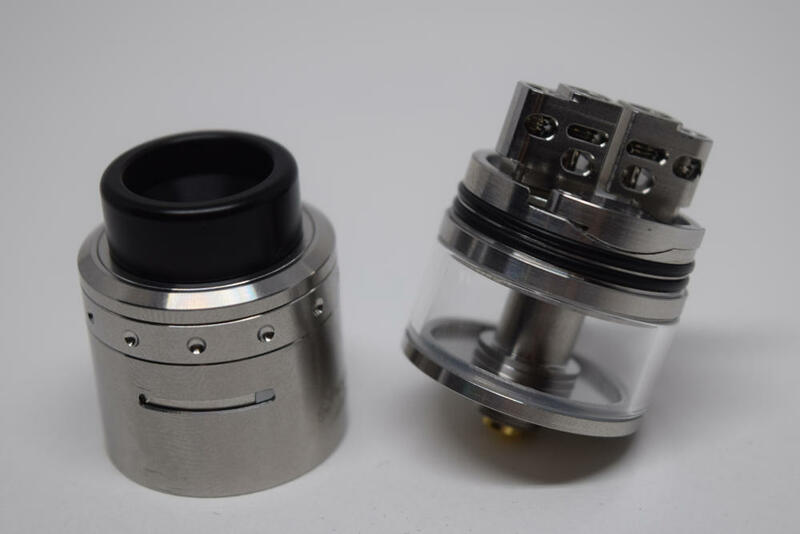 GeekVape have basically taken the innovative build deck of their popular RDA and placed it atop a glass tank that holds up to 4 ml of e-liquid. 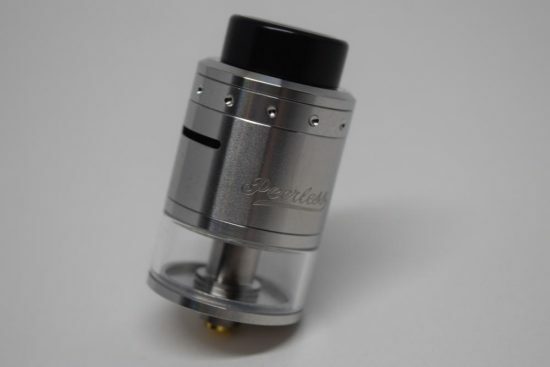 The Peerless RDA had an exceptionally deep juice well – a whopping 9 mm deep – but it was still a dripper, so if you’re looking for the same great vaping experience but with an enhanced juice capacity, the GeekVape Peerless RDTA is a great addition to your collection. 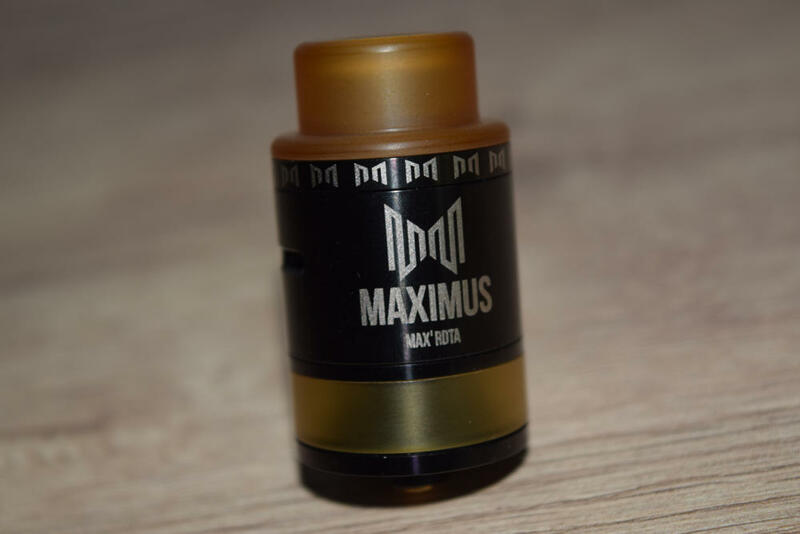 The sample I received for this review came in a black&orange cardboard box marked as “sample”, but the retail version of the atomizer is packaged in a clear plastic case that offers a great view of the product inside. In it, you have the 24 mm Peerless RDTA sitting snug in a styrofoam holder, and underneath that you have a bunch of useful accessories. 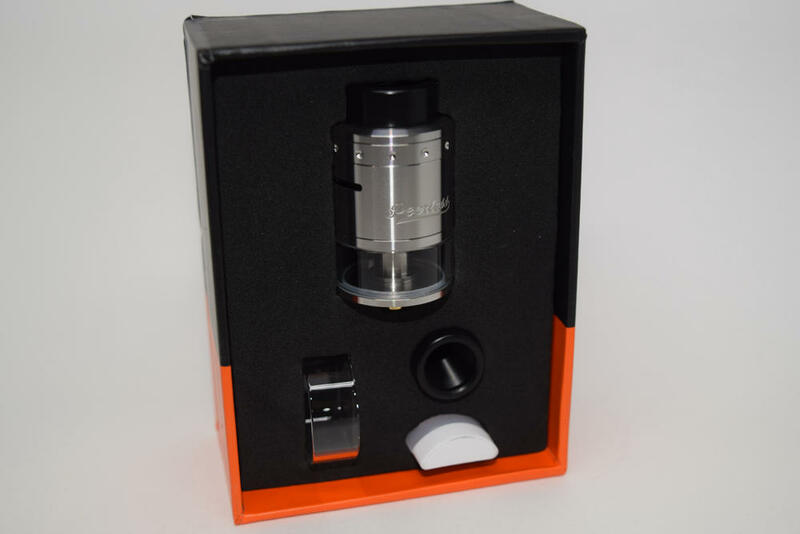 The Peerless RDTA comes with an 810 Delrin drip tip, but the kit also includes a stainless steel 510 adapter as well as a black 510 drip tip, if you prefer a more restrictive draw. You also have a ceramic plug for single coil vaping, a spare glass tube, a tri-head screwdriver, loads of spare o-rings, a gasket for the fill port and some spare hex screws for the build deck. Efun.top is currently selling the kit for just $19.99 – 70% if you log in on their site – which, is simply a bargain for the included accessories alone. The GeekVape Peerless RDTA is 24 mm in diameter and 42 mm in length, making it significantly taller than the Peerless RDA. That makes sense, considering that the RDTA has a tank section underneath the build deck. 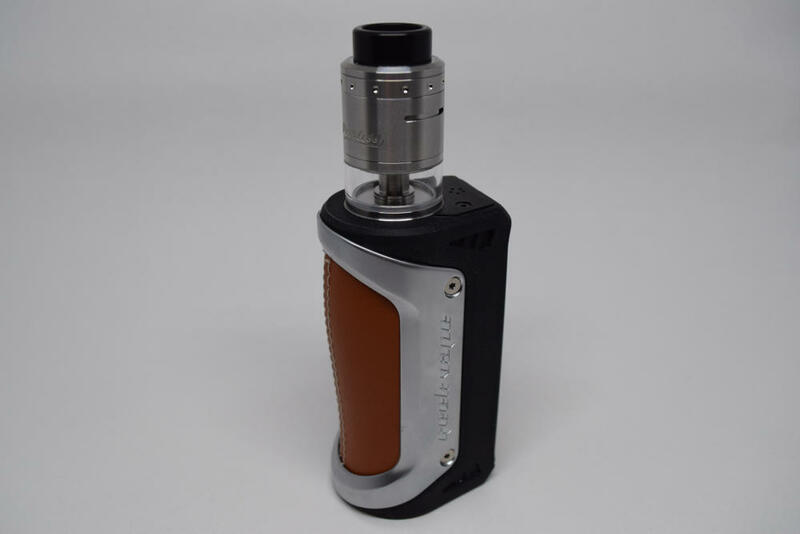 It is made primarily of stainless steel and glass, and can hold up to 4 ml of juice. 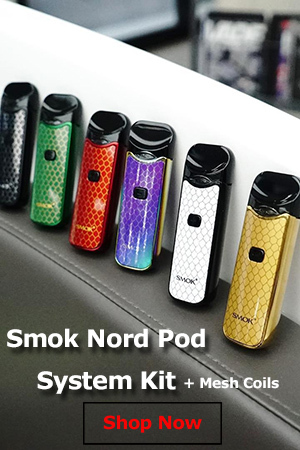 GeekVape has this available in a variety of colors, but I received the stainless steel version, which looks amazing, in my opinion. 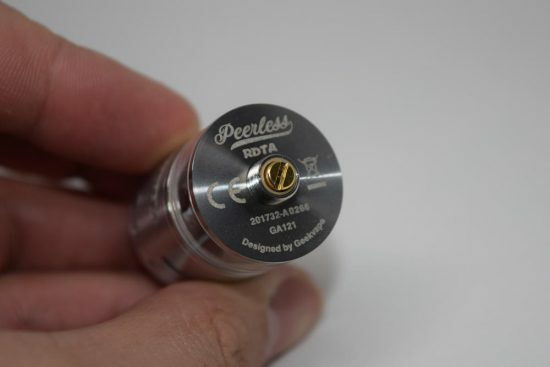 Even though they share the same name, the Peerless RDTA and the RDA don’t look very similar. Apart from the deck, which has also suffered some minor design changes, everything is different. 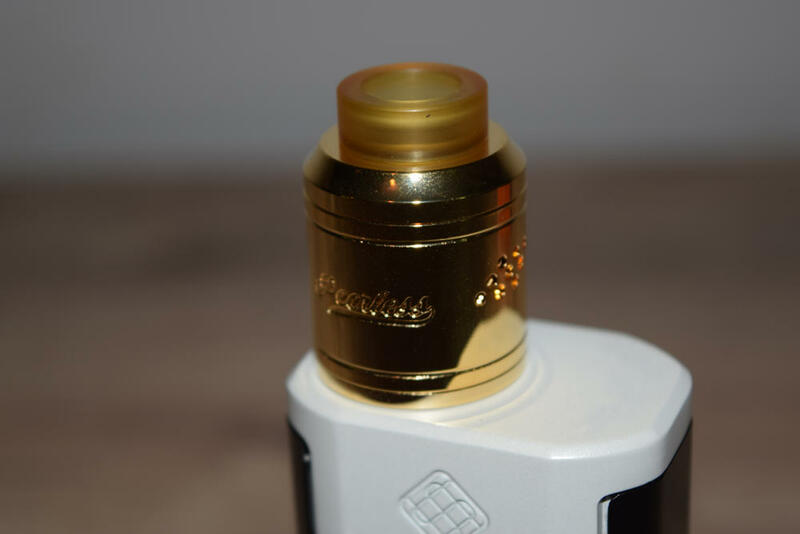 The top cap on the RDTA isn’t as rounder as on the dripper and is press fit onto the barrel section, the airflow slots are different, and the drip tip is made of Delrin, not Ultem. That said, the GeekVape Peerless RDTA is no less of a looker than the smaller RDA. If anything, it looks a bit better. Apart from the “Peerless” logo etched into the barrel, and the ring of tiny indentations on the airflow control ring, there really aren’t any design details to talk about, which, being a fan of minimalist design, is a plus in my book. The machining is top notch and the o-rings are tight enough to prevent leaks but, at the same time, smooth enough to make removing the barrel station and rotating the airflow ring a breeze. On the inside, the top cap doesn’t have that dome shape we’ve seen on so many atomizers lately, but I really couldn’t say that the flavor is affected in any way. 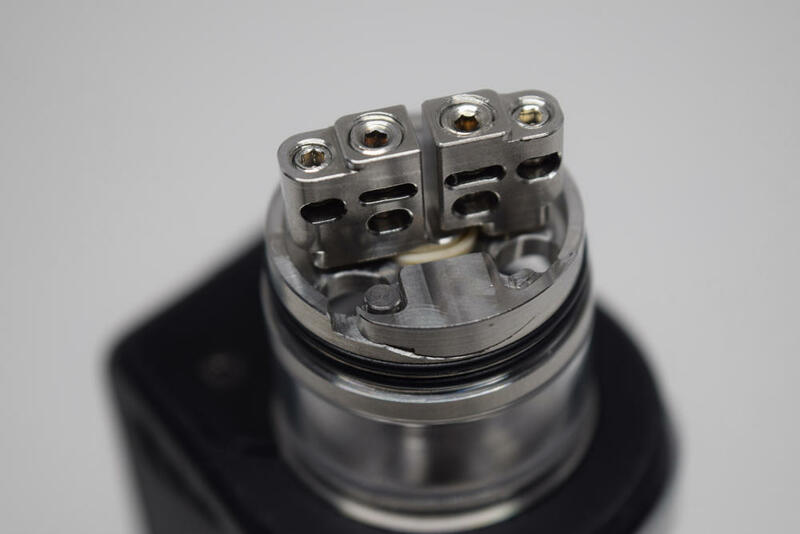 The build deck has the same general design as that of the Peerless RDA, with three pairs of holes on each of the two massive posts. The only difference is that the outermost holes have been raised a couple of millimeters, to make installing large coils easier. This being an RDTA and all, the build deck required a fill port for the tank, and GeekVape opted to have on located right under one of the coils. It doesn’t sound like the best place to have a fill port, but after using this atomizer for about a month now, I can tell you that I’ve had no issues with it. Whether you’re using a glass dropper or a unicorn bottle, refilling is clean and easy, and the coil doesn’t get in the way at all. All in all, I was very impressed with the new GeekVape RDTA, both in regards to the design and the quality of the materials and machining. Having used so many other great GeekVape RDTAs in the past, like the Griffin 25 or the Avocado 24 RDTA, I expected this kind of quality, and the Chinese company did no disappoint. The GeekVape Peerless RDTA is squeaky clean right out of the box, but I would highly recommend giving it a thorough rinsing under hot water just to be sure. One of the things I love most about this atomizer is how easy it is to take apart and reassemble. Some bottom tank RDTAs require you to unscrew the connection pin to remove the glass tube, but not this one. All you have to do is unscrew the glass section and it comes off along with the metal base. As I mentioned, the top cap is press fitted onto the stainless steel barrel, but that just makes assembly a little easier, as far as I’m concerned. Once you’ve cleaned everything and reassembled the Peerless RDTA, it’s time to install your coils. This atty works best in dual-coil mode, but you can also use it with a single coil, thanks to the included ceramic plug. It goes into the two wicking slots on either side of the build deck and completely shuts of the airflow on that side. Thanks to the innovative design of the posts, you can install your coils in a variety of ways. You can insert both in just the two large slots on the bottom, or you can make use of the outer slots as well, which are most useful when you have larger coils. 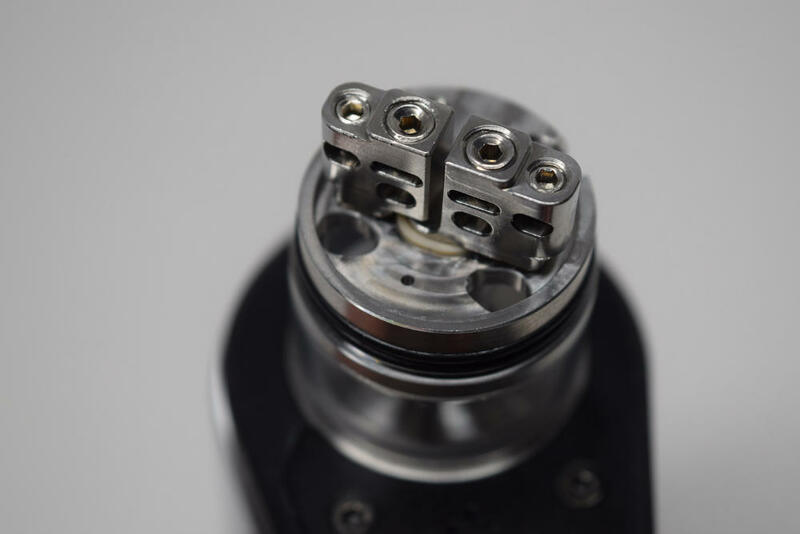 The two elevated slots in the middle of the posts are best suitable for simple round wire, as the thick screws coming down from the top keep them fixed in place, while the other two pairs of slots are designed for kinds of beefy and exotic coils. The most important part of setting up an RDTA is the wicking, and the Peerless RDTA is no exception. The bottom of the build deck features four wicking slots – two on each side of the posts – but don’t give into the temptation of stuffing them with cotton. This is one of those cases where less is more, so make sure to thin out your cotton leads and cut them so they are barely visible in the tank. It may sound a bit strange, but the longer they reach into the tank, the harder it is for the juice to reach the coils. Properly wicking an RDTA requires a bit of experience, so if you don’t get it right the first time, don’t worry, almost nobody does. Just don’t give up on a device just because it doesn’t vape as well as you imagined. 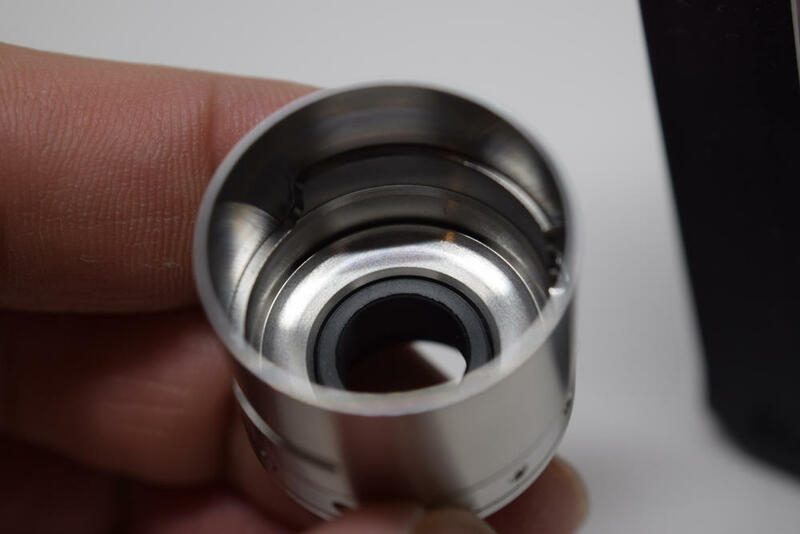 Most of the time, it’s not the atomizer, but user error, so be patient and try re-wicking it. There’s no point in beating around the bush, the GeekVape Peerless RDTA is an exceptional atomizer. 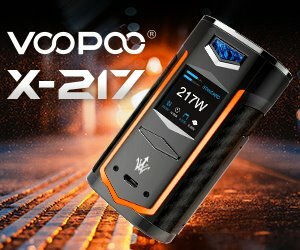 I’ve tried several of GeekVape’s rebuildable tanks in the past, including the popular Avocado 24 and Griffin 25/Griffin 25 Plus, but this is undoubtedly their best one yet, at least as far as I’m concerned. Design innovation and build quality aside, the Peerless RDTA just vapes great. Vapor production obviously varies on your coil build, but I can tell you that even with the two stock coils provided in the package it produces more than enough vapor for most users. It’s probably not ideal for cloud chasers, as the airflow slots on the barrel are narrower that they would like, but for most of us they are just right. I, for one, actually enjoy the airy-yet-slightly-restrictive draw these slots produce, so I can’t complain. After seeing that the inside of the top cap was not rounded off in that popular dome shape, I was a bit worried that the flavor was not going to be on point, but I needn’t have been. The flavor you get from the GeekVape Peerless is just amazing, I would say it’s on par with the Peerless RDA, provided that you wick it correctly. If you keep your cotton nice and saturated, I guarantee that you will be rewarded with a mouthful of flavorful vapor. I’ve been using the Peerless RDTA for about a month now and I’ve experienced no technical difficulties at all. 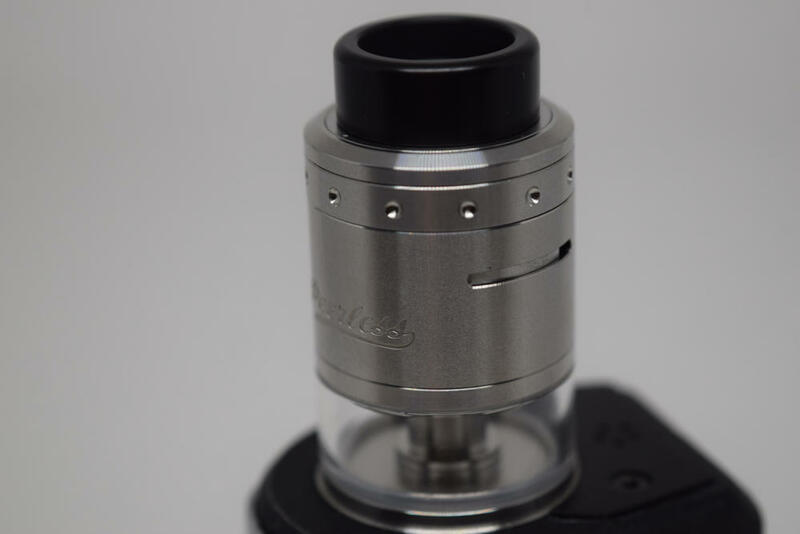 Leaking is a non-issue, refilling is nice and simple, and the tank itself seems to be withstanding wear and tear very well. I really can’t think of anything bad to say about the way the GeekVape Peerless RDTA performs. I really wish I could, if only to make this review sound more objective, but there just isn’t anything of note I can mention. I’m sure anyone could come up with a minor subjective con, but not one that actually impacts the vaping experience. Oh, wait, I almost got carried away there and forgot to mention e-liquid consumption. 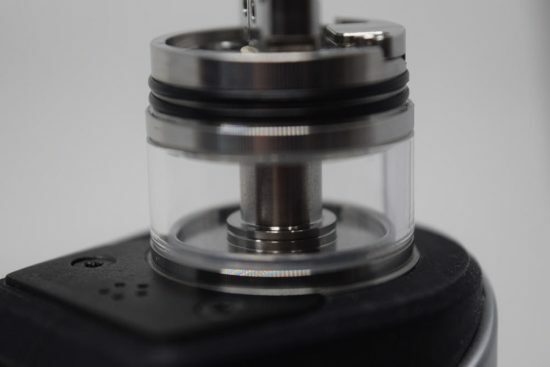 That could actually be a problem for some people, as the glass tank can only hold 4 ml of juice, and that can evaporate very fast if you’re using a low-resistance dual-coil build. It’s a guzzler for sure, but I for one don’t mind paying in juice for a great vape. GeekVape have really hit it out of the park with the new Peerless RDTA, an all-around great atomizer that seems to strike a perfect balance between great vapor production and amazing flavor. I had been using the Peerless RDA at home regularly, but this thing now allows me to take the same awesome vaping experience on the go with me, and it’s already won a place in my usual rotation of atomizers. Do I recommend giving the Peerless RDTA a chance? Definitely! If you’re in the market for a new and versatile tank, you’re going to have a tough time finding something better.